At the Old Jail Gallery in Lahaina, Ryan Hanscam receives the Gianna Mitchell Best In Show Award for his piece titled “In the Smoke”. 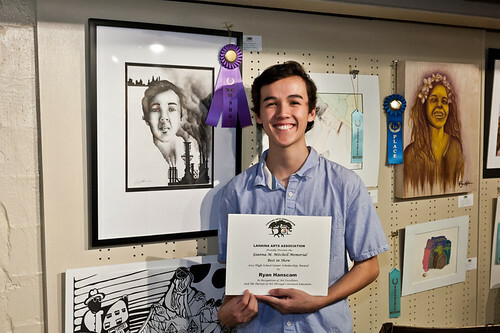 Graduating senior Ryan Hanscam was among the winners of several college art scholarships recently presented by the Lahaina Arts Association. The $3,500 in scholarships were presented to Maui County students who are pursuing art in college as part of its 36th Annual Art Exhibit and Partial Scholarship Contest. Hanscam received four tuition assistance scholarships, including the Gianna Mitchell Best In Show $1,000 Award, for his piece titled “In the Smoke.” Hanscam, a Baldwin High student, also received $500 for the piece in the LAA first place drawing award. He also won the Martin Rockwell first place painting award ($500) for a piece titled “Giggly Moments.” In addition, Hanscam won the Gianna Mitchell first place 3D award ($500) for his “Untitled” piece. The funds for the Gianna Mitchell “Best in Show Scholarship” were raised at the Gianna Mitchell 4 the Luv of Art event celebrating the life of the late Maui artist. The Lahaina Arts Association is a non-profit charity dedicated to providing Maui County youth access to the creative arts through education and artistic opportunities. LAA offers no-cost art classes to children on Maui and Molokai through the Maui Youth Art Outreach Program. LAA also provides a Youth Mentoring Program and awards partial tuition-assistance scholarships to graduating Maui County students. LAA hopes to inspire creative thinking and artistic expression by creating opportunities for art education through the support of grants, foundations and individual donations.